Father’s Day is just around the corner (Sunday, June 21). 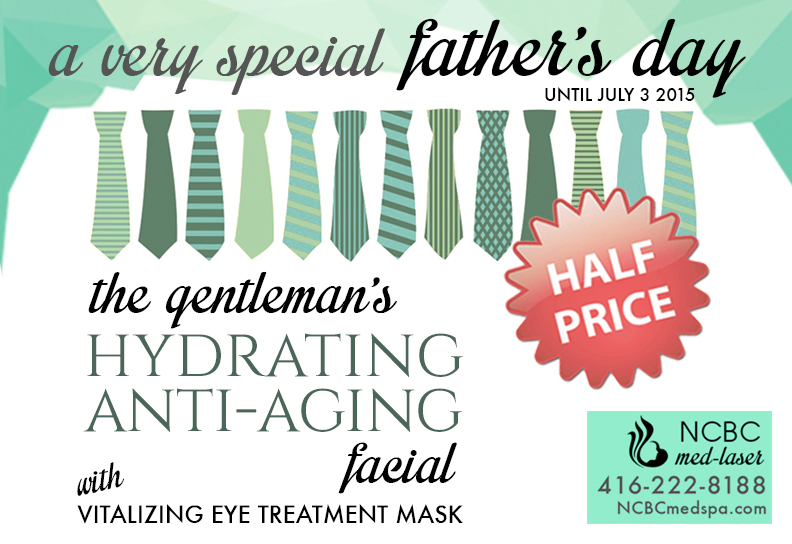 Give him the relaxing, rejuvenating experience of our Gentleman’s Hydrating Anti-Aging Facial– at half price! Our Hydrating Anti-Aging Facial breathes life back into aging skin by promoting collagen production, hydration, blood circulation, brightness, and elasticity– while reducing dryness, fine wrinkles, capillaries, and redness. Nutrient-rich moisture transforms the driest of faces to restore a fresh appearance while targeting the specific needs of aging skin. Includes Vitalizing Eye Treatment Mask, Nourishing Serum Therapy, and pressure point massage. Plus, if you let us know in advance, we can also include a custom-printed Happy Father’s Day card with his name on thick ivory cardstock with a pearlescent border, as well as beautiful, handmade gift wrapping at no extra cost. Learn more about our remarkable facials here. 90 minutes total. Only $75 for a limited time (regular $150). Available for purchase until July 3 2015. Valid only at our Yonge St. location. Can be claimed within a 1-year period after purchase. Let him experience a radiant glow with this Father’s Day favourite at NCBC Med-Laser!